Compare Bearcat 880 with other CB radios. Uniden’s newest addition to its product catalog, Bearcat 880 is all you have been looking for and then some. This renowned Bearcat brand of CB radios promises to end your struggles with transmission and reception quality, nighttime use, and it has a host of features that keep you connected, entertained and informed of everything happening around and ahead of you. It not only looks stylishly gorgeous but also has immense power combined with a ruggedness that makes this the ideal CB Radio for the outdoorsy type. If you have used a Uniden CB radio before, you know that the models by the brand are among the best. While imperfect in some aspects, they triumph most other brands in features and functionality. Manufactured by the renowned Uniden, this model combines a great deal of power, functional features, and ruggedness that makes this radio sturdy and functional. Its design makes this radio an ideal fit for this century, and you don’t have to worry about looking like you just walked out of the 70s. Compatible with the wireless Uniden mic. Dynamic squelch control, ANL, and NB for clear signals. Noise cancellation mic enhances the transmission clarity. Simple and compact design and it’s easy to mount on any vehicle. 7-color backlight for readability and easy viewing. The emergency channel is easily accessible. Has a channel scan feature. You get live weather updates. Display control with day and night modes. You cannot turn off the beep sound while switching channels or pressing the keys. The internal speakers aren’t the best at a high volume. Extra-long 6-Pin noise canceling microphone. Access to all the 40 FCC-approved channels, as well as the NOAA weather channel and the 9/19 emergency channel. RF Gain and Squelch control. Radio diagnostics and talk back. This CB radio is priced right for its features, and it makes an excellent companion for long-distance and night drivers. It also one of the best long-range transmission CB radios on the market. This is the ideal CB radio for night drivers and serious CB users looking for a stylish feature-packed and highly functional radio. Its advanced backlighting system and the customizable digital display make it an ideal fit for any serious night drivers. It enhances safety, and it’s great for weather and CB radio communications monitoring. One of the most attractive features of this Bearcat 880 CB radio is that it gives you access to all the 40 FCC-approved channels with the highest possible reception clarity, strong transmission, and a high-quality range. With access to these channels, you don’t have to worry about missing important information or communications. Uniden BC880 also has access to the NOAA weather channel keeping you informed on the varying weather conditions. It also gives you access to live updates in the event of severe weather. It also has a channel scan feature. Other than NOAA, the CB radio also connects you to Channel 9/19 instantly for emergency access. As a night driver, you need a CB radio you can control and use easily in the night for information and safety. Uniden’s Bearcat 880 makes that possible with its 7-backlit color options that you can customize for your radio. The color display is not all about aesthetics but a way of ensuring that you are easily connected to a channel like an emergency channel in the middle of the night if in trouble. Backlighting makes it easy to read the details on the display screen. The backlit display also comes with TX/RX indicators and a prominent S/RF/SWR digital meter that allows you to tune the radio with hassle-free. You can read and adjust the radio while still focusing on the road. It boasts a 4-watt transmission power. This is what you need to connect to channels far and wide. As mentioned above, you can expect clear transmissions and reception when using this radio. The clarity comes from the powerful transmission power and the blanket/ noise filter. The latter reduces the background noises. It also boasts a 6-pin noise-canceling microphone which enhances the quality of sound at the end of the line for the person you are talking to. So, you get to enjoy static-free and clear communication. Other features fitted in the 880 to control the quality of sound include the dynamic squelch control, and the Hi/Lo Mic gain control. The Noise Blanker and the Automatic Noise Limiter (NB/ANL) noise reduction feature reduces interference or any unwanted static from different sources. A CB radio is another piece of junk without an antenna. For this reason and the fact that you may have to buy a different antenna if the first one breaks, Uniden’s 880 is compatible with all CB antennas available on the market. Its cable utilizes the standard CB PL-259 connection. The 880 mounts with the “U” mounting bracket on any flat surface. This radio is compatible with the wireless CB microphone recently unleashed by Uniden. So, if you need more freedom, this mic’s got you! Fitted with a radio diagnostics feature, you can resolve most issues with little effort. It also has an easy-to-read laser etched keys, as well as a 6-4 pin microphone adapter. It has a public address system for communication with many people outdoors. The radio output of 6 and 4 watts for SSB and they can be modified. You can also mount the radio, and so it works well when you have limited space. The extra-long mic cord lets you operate the radio away from where it’s mounted. The wireless mic option will also work here. While it boasts several features, it lacks when it comes to mods. This Uniden Bearcat 880 cannot be modded. Q: Does it have safety features? A: Yes. Instant access to the 9/19 emergency channel, live weather updates, and the NOAA weather channels. Q: What’s its maximum power output? Q: Can you use this CB in the house? A: Yes. All you need is a 3-10amp, 12V power source and an outdoor antenna. Attach your microphone bracket to the car dash or the side of the radio. Attach your CB radio to the bracket. Press the MENU/OK Key to enter the DIAG level. From the DIAG level, you can check for antenna mismatches, power levels, or the RF power levels. Every 6 months, check the SWR, ensure that all the electrical components are tight, inspect the coaxial antenna cable for breaks or wear in the shielding, and ensure that all the mounting hardware and screws are tight. Note that the radio is meant to give you trouble-free service and that it doesn’t have any serviceable parts inside so, it doesn’t require maintenance except for the replacement of the inline fuse located in the fuse holders of its DC power cord. Bellow you can see a compare table beetween BC 880 with other cb radios on the market. 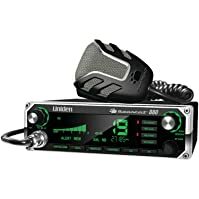 If you are on the market for the best long-range transmission CB radios, this Uniden Bearcat 800 might be your perfect fit, especially if you are a long-distance night driver/ traveler. Its 7-color backlit display and laser etched keys enhance its readability, and you can configure it for night and day use. It’s easy to mount on the car thanks to its small and compact design. And, thanks to its noise cancellation, interference reduction, and signal clarity features, you can expect great transmission from all the 40 FCC-approved channels, the weather channel and the emergency channel. It also boasts effortless control systems and diagnostics. Although this CB radio cannot be modded, it is one of the best on the market and gives you value for your money.